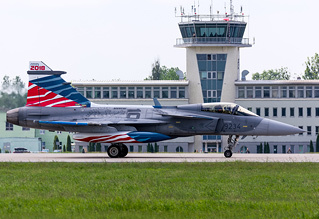 Hosted by the Polish Air Force, the 2018 NATO Tiger Meet spotters day was held at Poznan Air Base. The annual NATO Tiger Meet spotters day has a reputation for being a well-organised and run event, where the enthusiast is located in a spacious compound that has been positioned with photography in mind where aircraft taxi by in close proximity and the runway is also within easy reach, allowing for close interaction between those attending and the pilots in the cockpit. 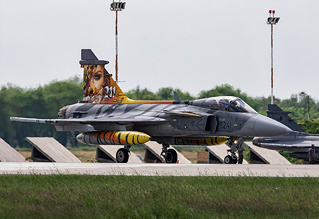 It is a reputation that has been established over many years of events organised by the NATO Tiger Association at host bases all over Europe. The 2018 event held at Poznan ticked none of these boxes and has tarnished this reputation with levels of organisation that can only be described with one word: shambolic. 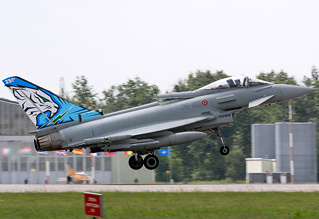 Andy Evans reviews the Tiger Meet spotters day at Poznan for UK Airshow Review. Photography by the UKAR Staff team. Traditionally, the annual event has been organised by the Tiger Association themselves with the assistance and co-operation of the host base/air arm. 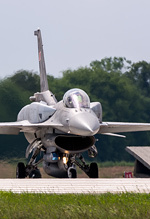 Unusually, the Polish Air Force directly organised the 2018 event via a third party events company and it is clear that this decision was a fatal error. 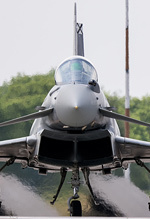 Applications to attend the event were accepted from mid-February including an option to include entry into the Poznan Airshow occurring that weekend which, on face value, appeared to be excellent value for money. It was at this point the first alarm bells started to ring for many that organisation may be a little lacking. After paying your money and submitting details for a security check, there was no news other than the occasional "bear with us" Facebook post, and rumours also began to circulate that photography might be into the sun. As the date of the event approached, there still had been no news until, eventually, tickets began to arrive in people’s email inboxes in a seemingly chaotic order. There were those, however, that did not receive their ticket and, rightly concerned, enquired with the organisers as to the progress of their tickets. E-mails and Facebook messages (both private and public) were largely ignored, however those that did manage to coerce a response from them received quite unprofessional and aggressive e-mails, almost as if their concerns had caused offence. In the end, the final tickets to the event were not issued until just 48 hours before the gates opened which, when you factor in that enthusiasts were travelling thousands of miles to Poznan, is completely unacceptable. We also understand that some never received their ticket and attended the event on the off chance they had been accepted - to find a ticket waiting for them. As has been proven time and time again by the Tiger Association, it is not rocket science to get this right. Fast forward to the morning of the spotters day and, thanks to the weather forecast, spirits were high. The joining instructions advised that transport would be provided from a local shopping centre car park where tickets would be issued and security checks undertaken - with a note that the first bus would leave for the base at 7am sharp. As with any European event, a 7am start in reality meant that enthusiasts began arriving many hours before and politely queued for the ticket/security checks to begin. As 7am began the queue was quite large but no-one was worried and waited patiently. 7am came and went, yet we all carried on waiting. As frustrations grew, people wondered if they would ever be allowed on the base. Eventually at 7.45am the Polish Air Force arrived and opened the ticket office which finally began processing people at 8am. Chaos then continued to reign as the process was slow and, for reasons completely unknown to us, the Polish began issuing the wrong tickets to people even though everything was named and numbered. After arriving in the car park at 6:45 am, our party were finally issued a ticket and boarded the bus at 9:15am, a stage of the journey that was relatively pain-free which was the exception to the normal. At this point we were supposed to be issued with our ticket and go through security before entering the bus. In fact, not a single bag or ticket was checked by the Polish Air Force or their hired help, either in the car park or at the base. It goes without saying that in the current climate obtaining access to a military facility made the event an obvious target, a very easy target as it would have turned out. Arriving at the base itself we were greeted by an enclosure facing directly in to the sun opposite the dispersals which were the other side of the (raised) runway and approximately 120 metres away from the closest edge. Whilst it was clear that the sun was always going to be a challenge from this location, it was galling to see such a massive expanse of grass remaining unused next to the taxiway and main dispersals on the other side of the runway. Images were limited to runway shots of arrivals and departures plus shots of aircraft entering the runway (with their wheels cut off only) - at distance. The complete opposite of what historically has been expected of a NATO Tiger Meet spotters day. One would have thought that was the end of the issues with this event but as more attendees arrived at the airfield it soon became apparent the enclosure was unnecessarily small, resulting in a scrum for the best spots which were 3 to 4 people deep, made worse by those that believe it is perfectly fine to stand at the front of a crowd line with a pair of stepladders, blocking photography for anyone unlucky enough not to get a front row position. That aside, the visitors bore witness to a mass launch of deployed aircraft operating from the base for the exercise including the superb efforts of the German Air Force, sending both a Tornado ECR from TLG-51 and a Typhoon from TLG-74 - the latter in a full Bavarian Tiger scheme. The only nation this year not to apply a scheme to at least one aircraft were the Hungarians, however, that did not mean that the visitors got to see all the assembled special schemes. 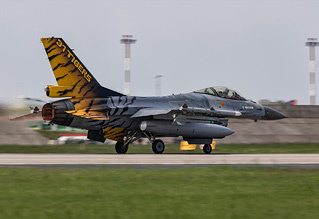 During the period that spotters were on base neither the French Marine Rafale M from 11F or the hosts' tiger schemed F-16C made an appearance. The former did fly in the afternoon once everyone had departed, only to be photographed by the lucky few that risked spotting on the base perimeter after the event had finished. Rotary-winged participation was strong with attendees from Italy (AB.212), France (Gazelle), Czech Republic (Mi-24/35), the Royal Navy (Merlin) and the RAF (Puma), the latter provided by 230 Squadron who bucked the RAF100 trend by having a fully painted tiger schemed aircraft - sadly also covered in the terrible RAF100 stickers. The helicopter contingent appeared to operate on missions with a pair of W-3 Sokółs that were also flying from the base. Unfortunately, witnessing them departing in the distance is as close as the helicopters came to the crowd. Once again, the event did not provide the up-close experience a Tiger Meet spotters day is supposed to give, made even more frustrating by the helicopters making a flypast down the runway at the very moment the final bus left the airfield - yet another example of poor planning. The final chapter of this organisational shambles was the transport arrangements back to the car park. Due to the main Tiger mission ending at close to midday it stood to reason that many would want to leave the airfield and relocate to the civil airport or the perimeter in order to achieve better shots. However, the organisers decided a single hourly bus from 1pm would be sufficient. What resulted was a lengthy queue to leave the airfield full of visitors that were becoming frustrated with the hosts. Eventually extra buses were laid on once senior officers got involved, however, the queue for anyone wanting to leave was between one and two hours, and with nothing happening on the airfield, that was a very boring and pointless period of time. Poznan has comprehensively achieved the accolade of one of the worst Tiger Meet spotters days ever organised and hopefully, the Association will have learnt their lesson. Let’s hope this is a one-off blip. 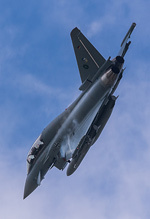 This year definitely felt as if it was an inconvenience to the base and the Polish Air Force, which is disappointing. That said, at the end of the day, we spent a nice day in the sun watching dozens of aircraft operate from a military base in the middle of Poland. 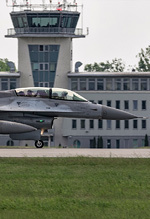 The 2019 exercise is being held at Mont-de-Marsan airbase in France from 13th-24th May. Should there be a spotters day it won’t be hard to produce a better event than this.